Chances are, you stumble upon a lot of articles during the day that look interesting, but you don’t have time to read them right away. 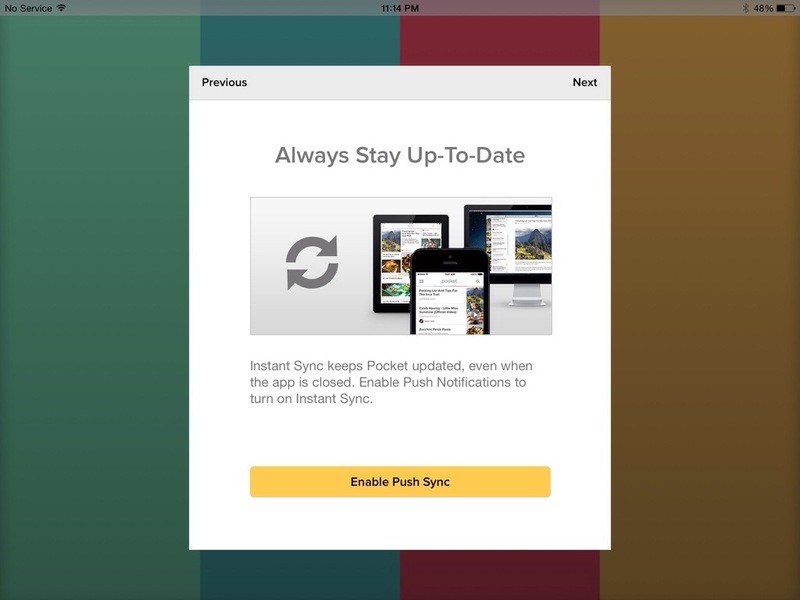 Pocket, previously known as Read It Later, is an application for managing a reading list of articles from the Internet and it fully integrates with Evernote and it has an impressive spread of supported devices and apps. 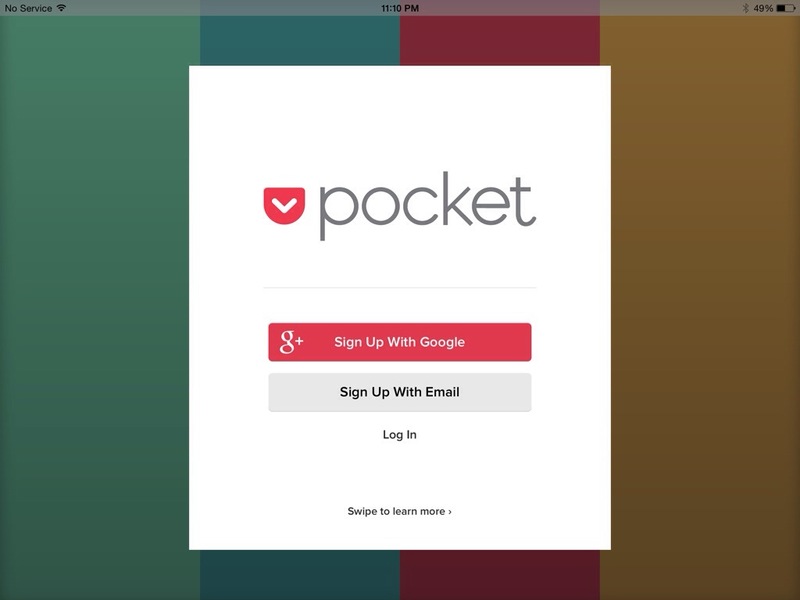 Supported Devices: Pocket has official apps for iOS, Android, Chrome, and the web. There are also third party clients for Windows Phone, BlackBerry, WebOS, and others available. It won’t work on a Nook. Supported Apps: Pocket has, by a good margin, the most support among third party apps. If you want to save articles from Found, Pulse, Flipboard, the Onion, TweetBot, the Alien Blue Reddit Client, and other apps, Pocket is the service to use. 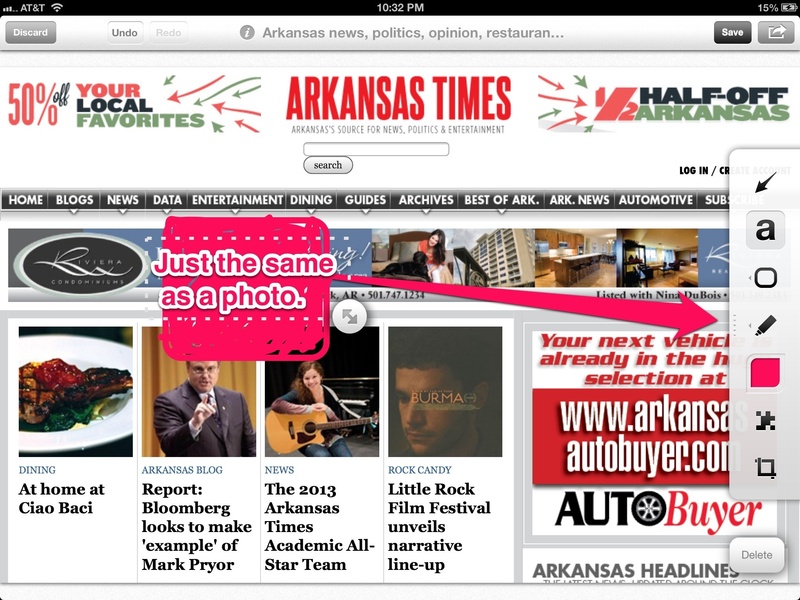 It also has browser extensions for Firefox,Chrome, and Safari, and a bookmarklet that works in any browser. For everything else, it has an easy save-by-email function. You can view the full list of supported apps here. 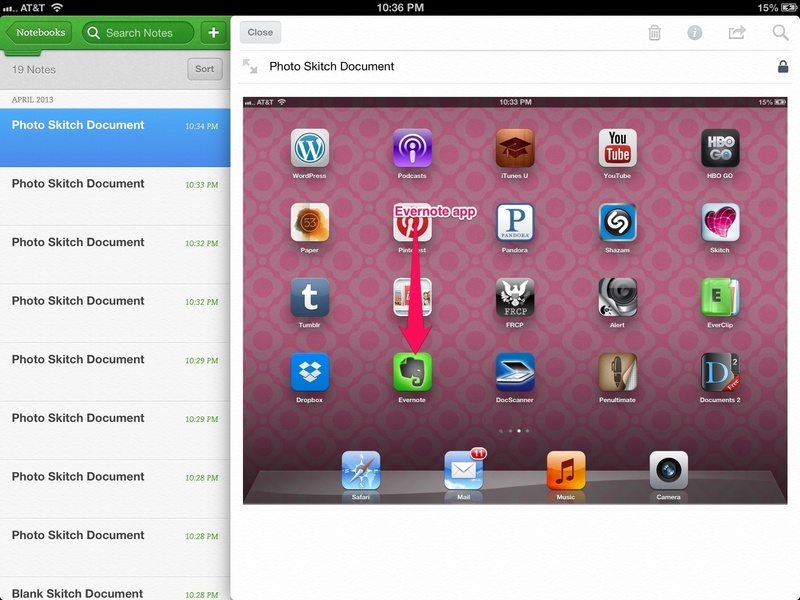 Why not just use the Evernote web clipper? 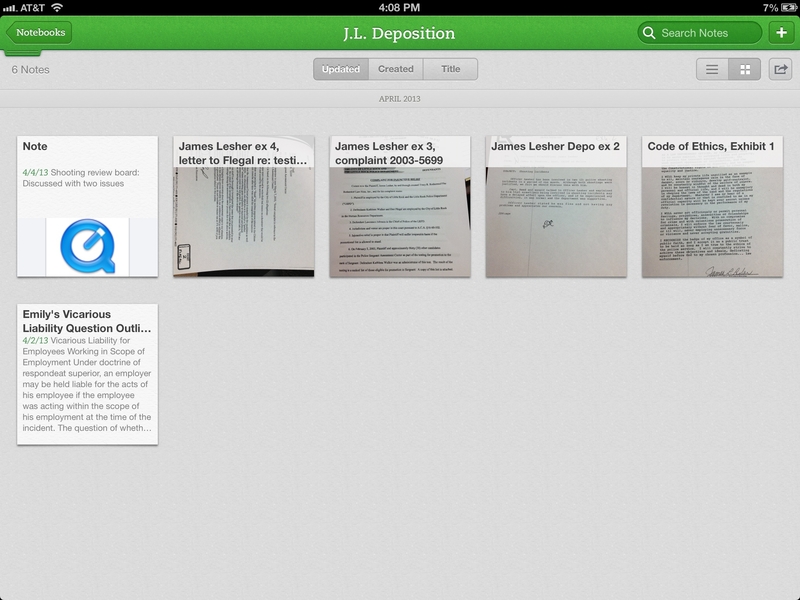 The Evernote Web Clipper is great, but it’s not for the same purpose. Evernote and the Web Clipper are great for clipping pages you want to hold onto for later, make notes on, or otherwise use. Pocket is for things you just want to read during your leisure time, though if you wanted you could obviously just use Evernote for the same purpose. Or if while you were reading an article during your leisure time that would be great to store in Evernote, you can always send it that way. 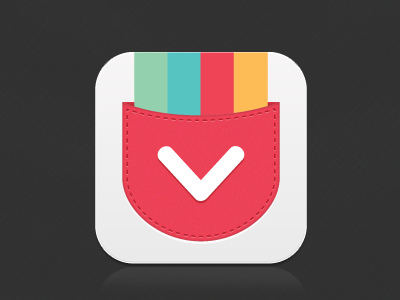 Interface & Features: Pocket is probably the most feature-packed of the “read later” apps. Apart from the features mentioned above, Pocket can also save embedded video in any article so you can watch them inline. No other read-it-later app does this (though you must unfortunately be online for this feature to work in Pocket). Let’s get started with Pocket for iPad! 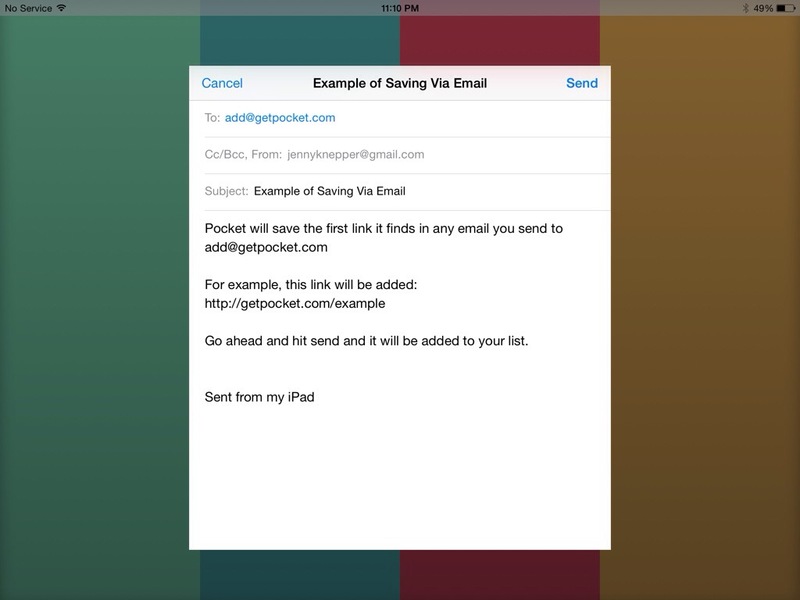 Then, you are going to add pocket as a contact so that you can email things to pocket later. Find your apps here (I only have twitter and tumbler, so it was pretty easy). And of course, they don’t want you to forget that you can buy things in the giftshop. And with that, you’re ready to start! Now you can read at your own leisure. 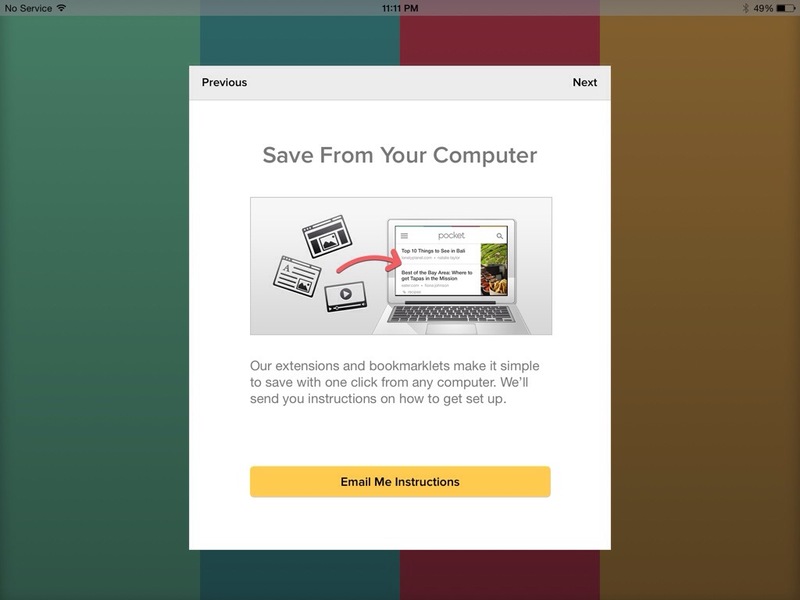 Send articles to other people via email, or—even better—straight to other Pocket users. Choose from two different fonts, multiple font sizes, and three different color palettes (black on white, white on black, and sepia). 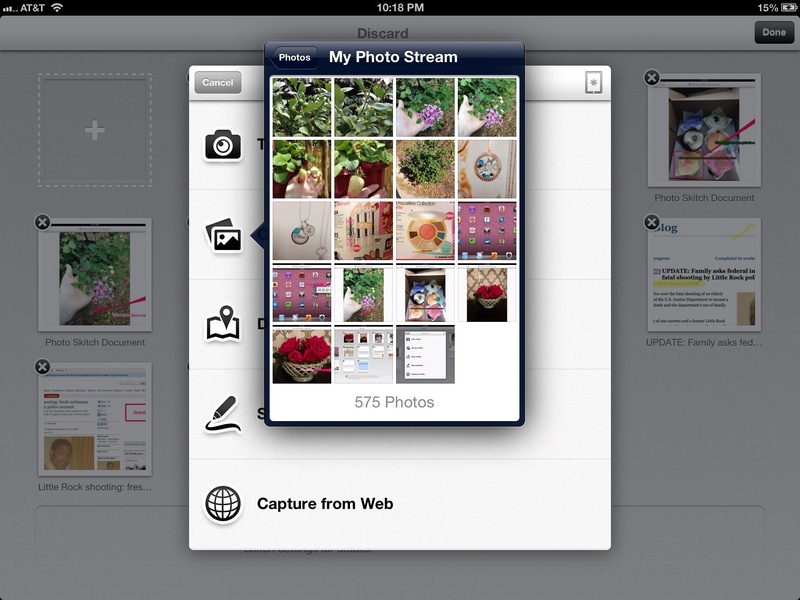 Choose from two views on the home screen: a tiled “card” view and a traditional list view. 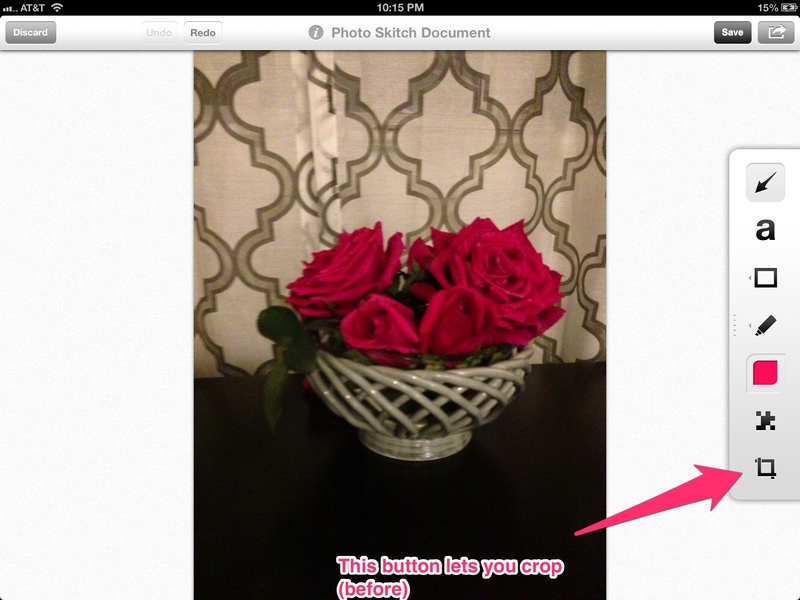 Today we are taking an in depth look at Skitch, which is an app that I use with Evernote. It’s made by the same people who make Evernote, so the integration is pretty much flawless. 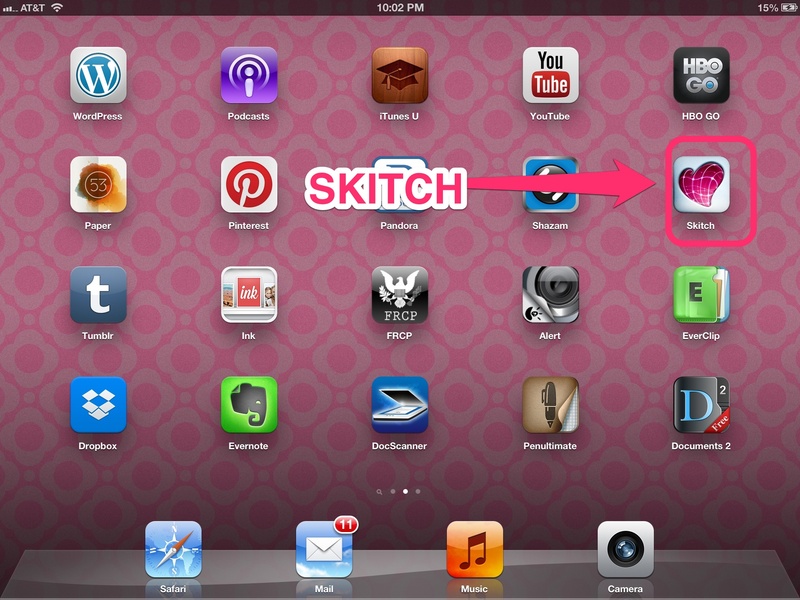 Skitch goes everywhere that Evernote goes, so let’s take a look! 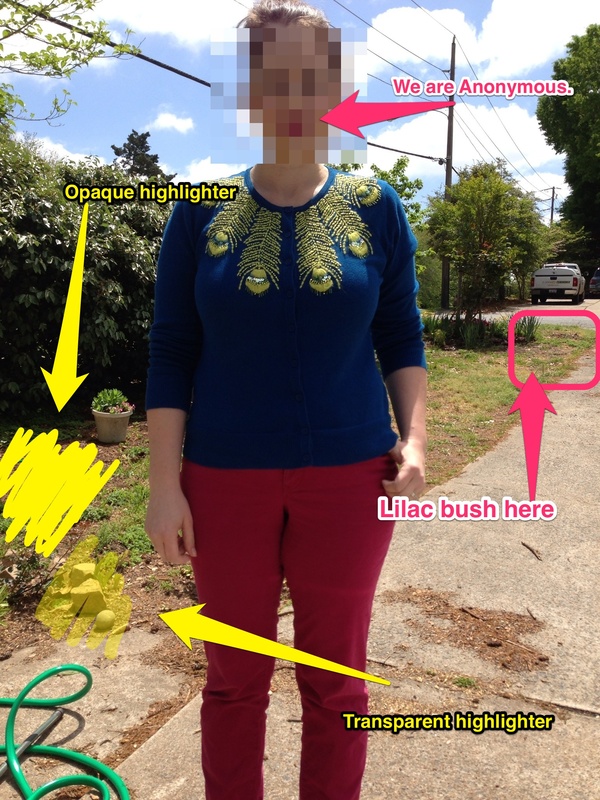 This is going to be a photo-intensive post, so you should know that clicking on a photo will bring up a larger version of that photo. 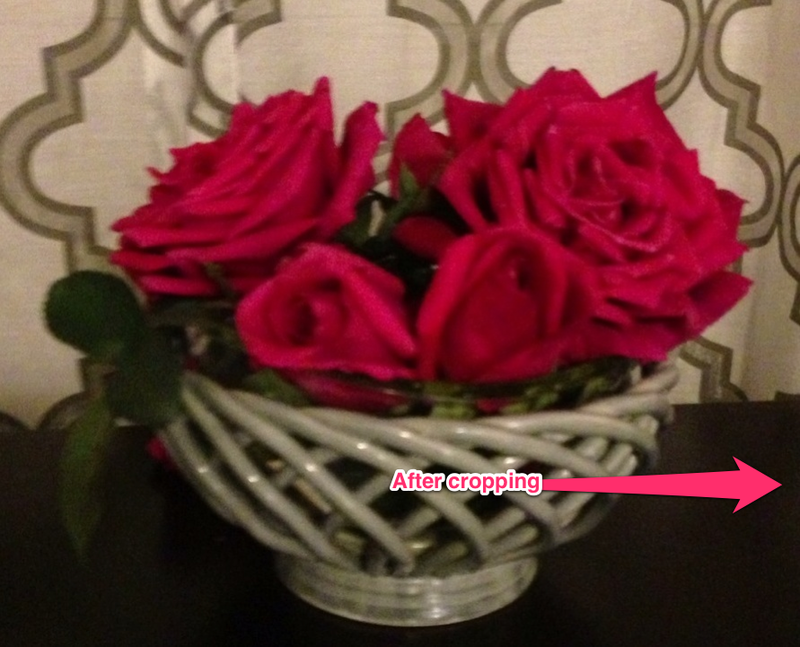 One of the biggest advantages of Evernote is the ability to use it on my iPad, and Skitch is a big part of helping me take photographic notes. It is downloadable at the app store, for free. OK, I Got it, Now What? This is the main screen. 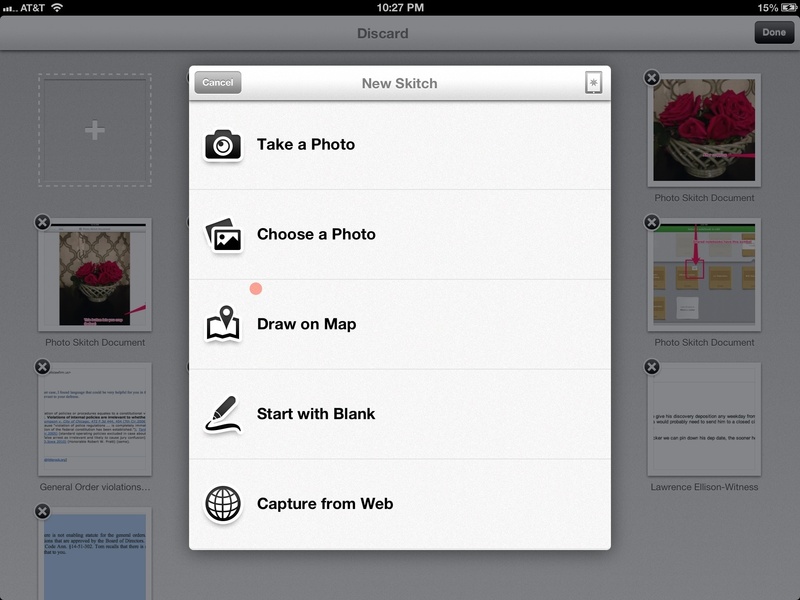 Just like Evernote, if you want to add a new skitch item, you click the plus button. If you want to discard an item, you click the little trashcan and an image like the one directly below will pop up and you hit the little “x” to delete it. The photo directly below this is the main menu. 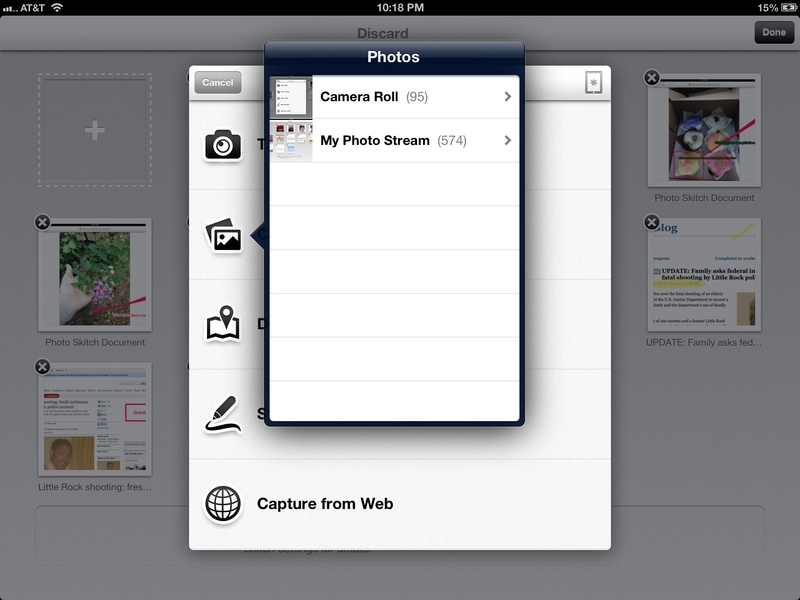 You can: 1. take a photo with your iPad; 2. choose a picture from your iPad or photo stream; 3. draw something on a map (the map is in Skitch); 4. start with a blank canvas; or 5. take a screen grab from a website. Let’s take each of them in turn. This option is pretty self explanatory. Once you hit this button, it opens up into a camera app and you just snap a photo. The remainder of this type of file is identical to the “choose a photo” option, so scroll on down for more on that. Now, you just select a picture and get to work! 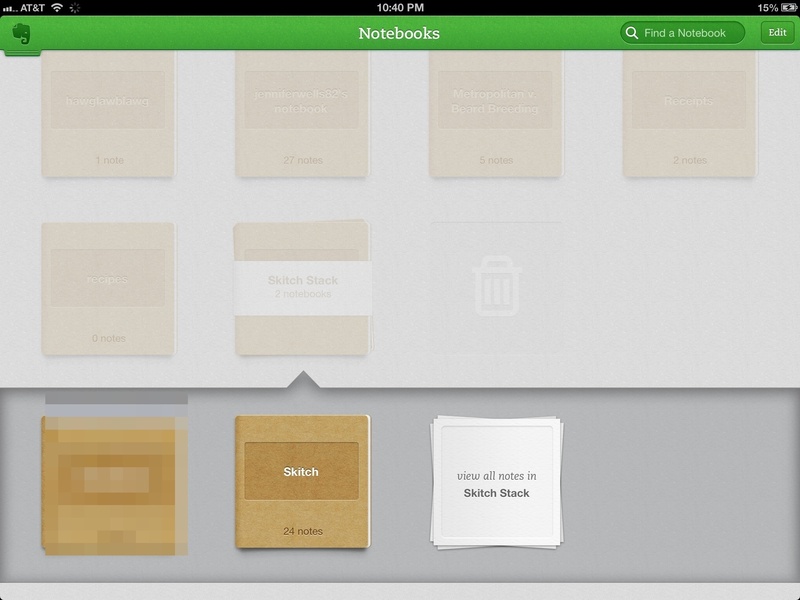 Select the “Skitch” notebook. 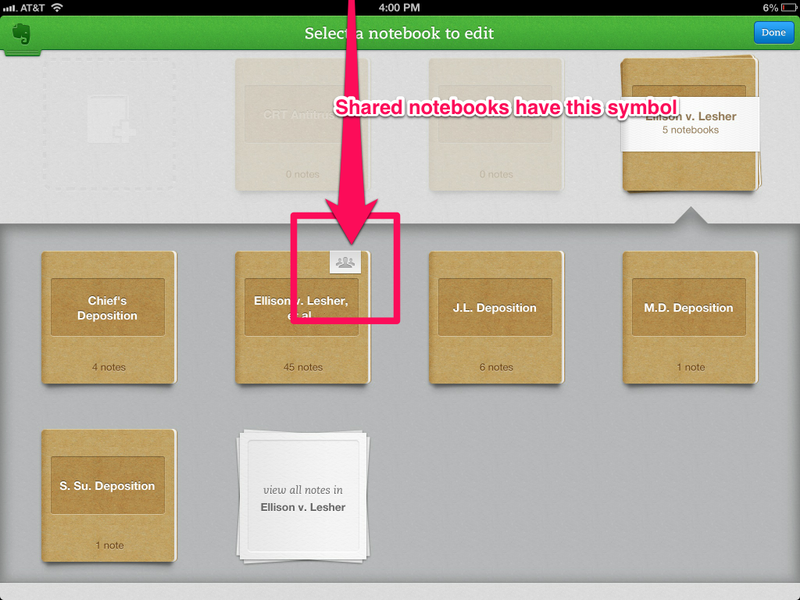 You will get this notebook when you open a skitch account and link it to your Evernote account. 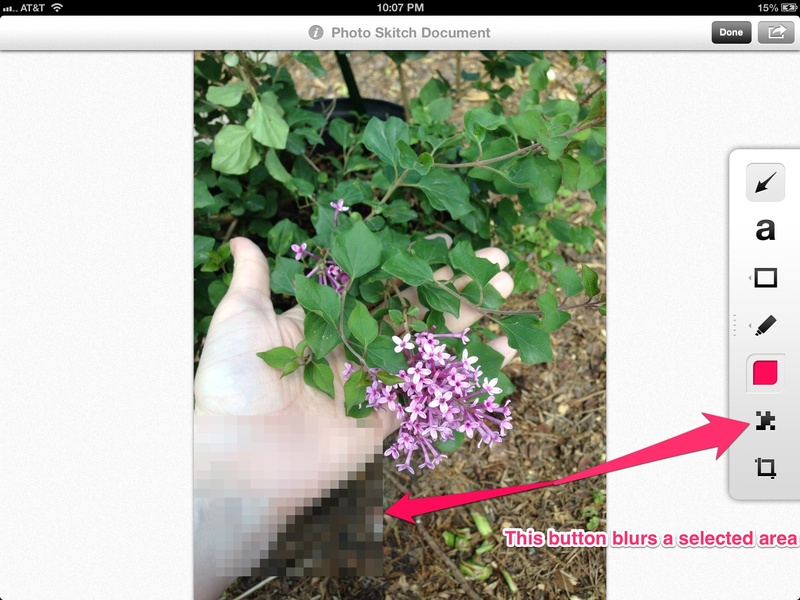 THis is the view of the skitch notebook. I never re-titled the pictures I took for this post, so they all have the same name. But, ideally, you would give your photos unique names to use that search feature later. Because this is Evernote, you can share anything you create in Skitch with someone else, by either creating a public link to email or post, etc., or by emailing someone individually who has an Evernote account and letting them share the note in their own notebook. So that’s it! 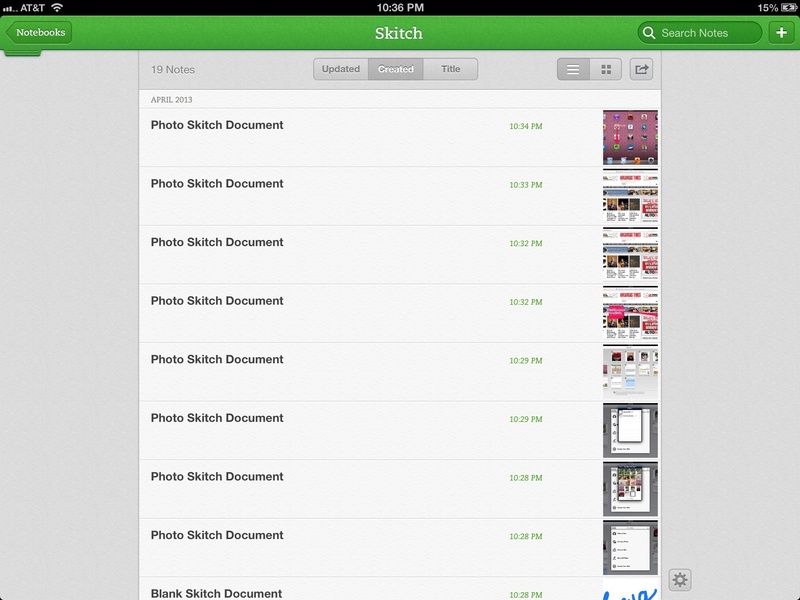 Now you are a Skitch Pro and hopefully it will help you get more out of Evernote. 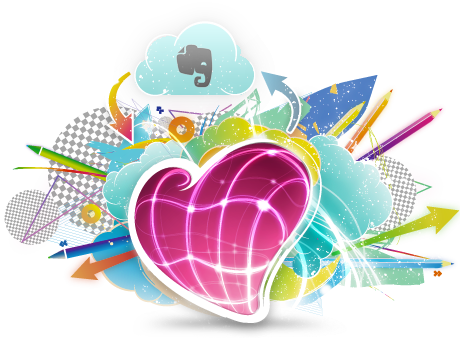 Stay tuned for some upcoming posts talking about the apps I use with Evernote to get the most out of it. 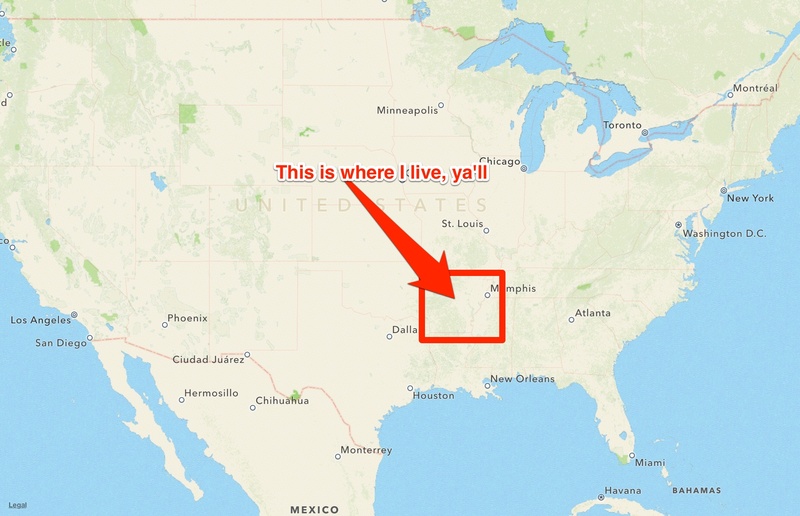 Today, I thought I would share a little bit about how I keep all of my information together across various platforms and locations. My main system is Evernote. 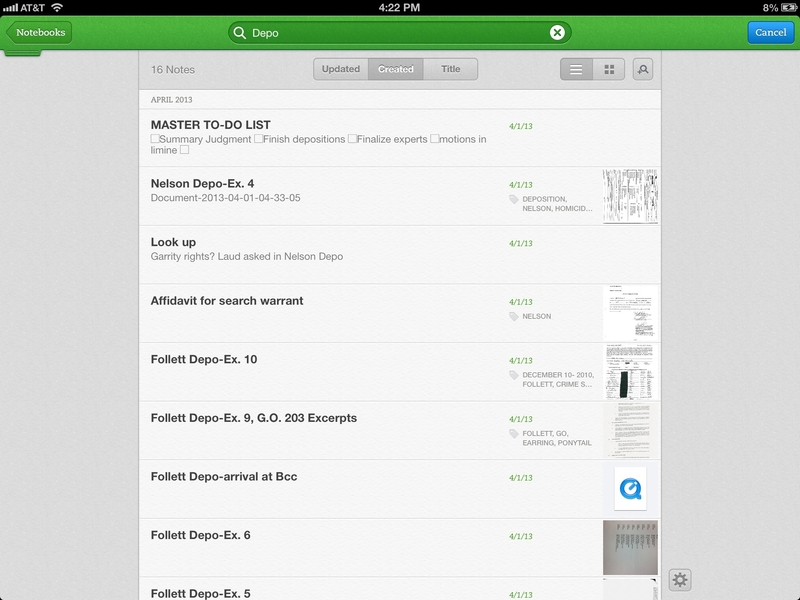 Evernote is my work BAF (best app forever). I actually love OneNote. I wish the people at Microsoft would quit being such big babies and put out a Mac edition, but they haven’t. I do have Outline for Mac, which I will probably cover later, but, for now at least, Outline does not have two-way usage. I can only use it to read OneNote, which doesn’t help if you are a super mobile, jet-setting* attorney like me and you find yourself in need of actually inputting information somewhere away from a PC. 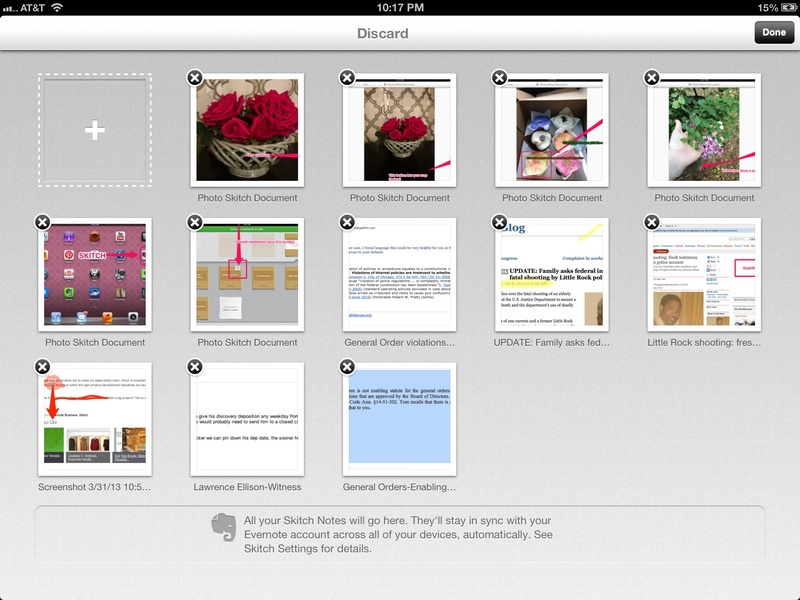 One of the biggest advantages of Evernote is the ability to use it on my iPad. I can do research at the doctor’s office, completely handle multiple days worth of depositions, and figure out what’s for dinner all from my iPad. So let’s dive in, shall we? 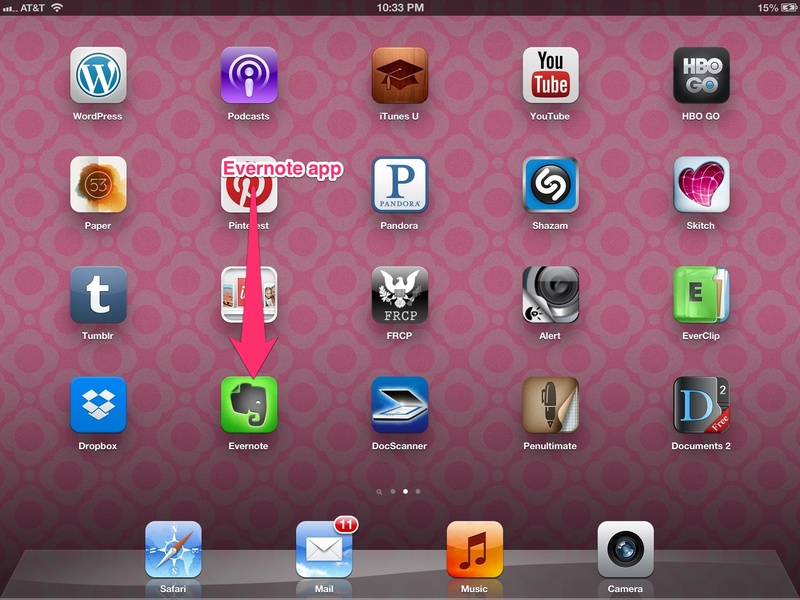 How Do I Get Evernote on My iPad? You go to the app store and download it. 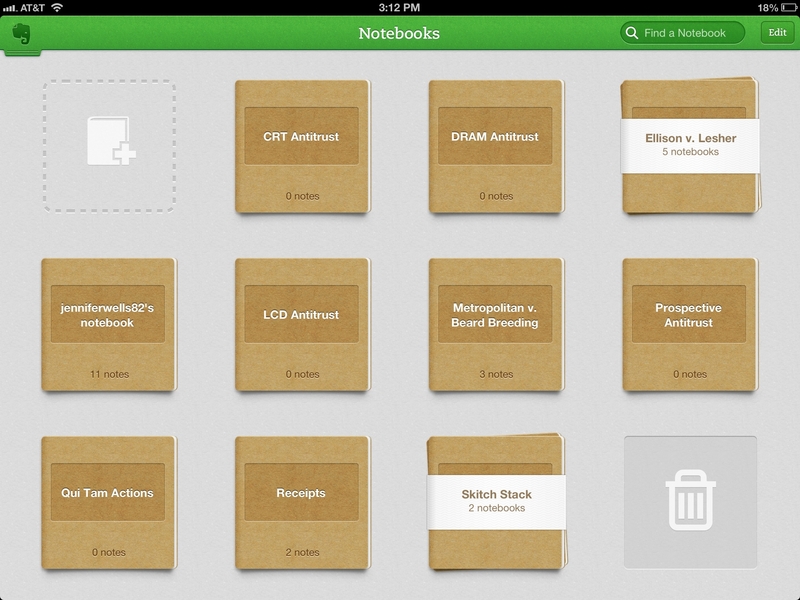 A basic Evernote account is free (as is the app). I started with a free account to try it out, which is what I recommend doing. Because I use Evernote so much, I purchased a premium Evernote account. It’s less than $50 per year and pretty much essential if you are really going to use Evernote heavily for work. Premium allows you to work offline, search all of your attachments, etc., so it’s pretty key. How do I download the Evernote App? Why do you have an iPad if you don’t know how to download an app? You should find someone else and just give them your iPad because you are wasting yours and the rest of this is going to be waaay too complicated for you. The first thing you want to do is create a notebook. This is where you are going to put everything. 1. Creating a Notebook: the upper left-hand button with the plus symbol lets you add a notebook. 2. Deleting a Notebook: the bottom right hand trashcan button lets you delete a notebook. Stacks are a group of notebooks that are all related. In the picture above, they are the notebooks with the white bands around them. 1. Every case I’m working on has its own notebook (at least one). 2. Large, active cases have more than one notebook, which are piled into a stack. I’m currently only working on one big case in Evernote (my other big cases are with attorneys who use dropbox, One Note, or just my work server, so I store the information for those cases there). So you can see that I have a separate notebook for 4 depositions and also a general case notebook. I use the general case notebook to stick loose notes into until I can organize them into a notebook. 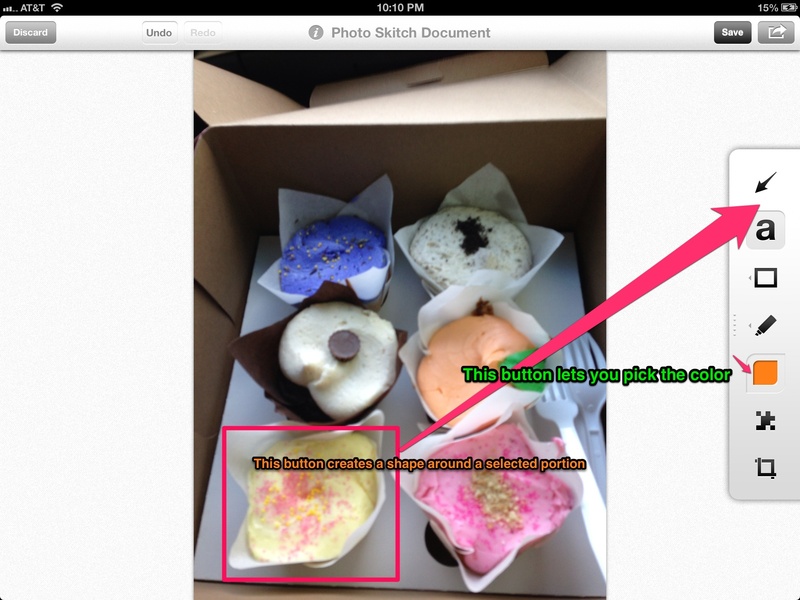 The first note is a voice-recorded memo to myself that I created directly in Evernote. The next four notes are picture of exhibits that I took with the camera on my iPad at the deposition. Taking pictures meant that I didn’t have to keep up with the actual exhibits. The last note is just a text note that I copied and pasted from a Word document. These were the questions that I actually ended up asking at the deposition. You can see that it searches the title and file itself. I try to be smart about how I title my notes. The title needs to make sense when I’m searching for an exhibit later. One of the biggest concerns for attorneys is the security of our documents. We often have sensitive client information stored in our massive files and it would be terrible if our clients couldn’t trust us with their documents. Evernote has one-way encryption, which means that user passwords are all scrambled to bits in their server, making them pretty much useless to anyone who is able to access them. Additionally, you can encrypt the data in a note yourself, but remember that Evernote can not retrieve this data for you if you lose it on your end. Avoid using simple passwords based on words found in a dictionary. Never use the same password on multiple sites or services. Never click on ‘reset password’ requests in emails – instead go directly to the service by typing the address into a browser address bar or using a bookmark. Finally, make sure your iPad itself is secure. I have mine set to lock if I’m away from it for a minute and it requires a four digit pin to unlock. Additionally, I have the settings to remotely erase the data on my iPad enabled, for worst case-scenario situations. *Can I call attending depositions at the Municipal League jet-setting? Let’s go with yes.